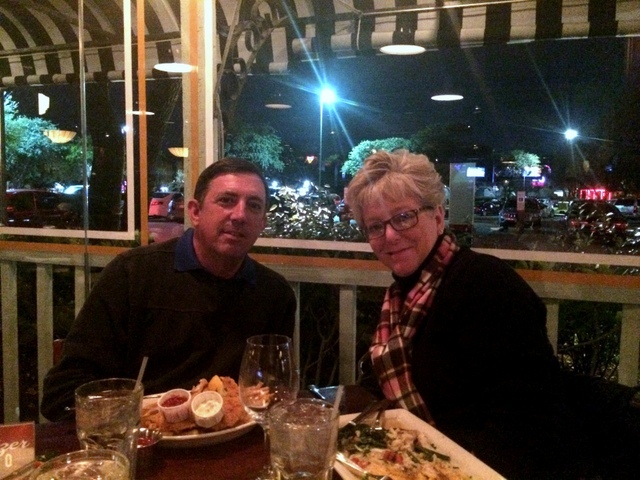 Chair Care Patio was started in the late 80′s in Deb and Steve Martz’s, Dallas, TX garage. 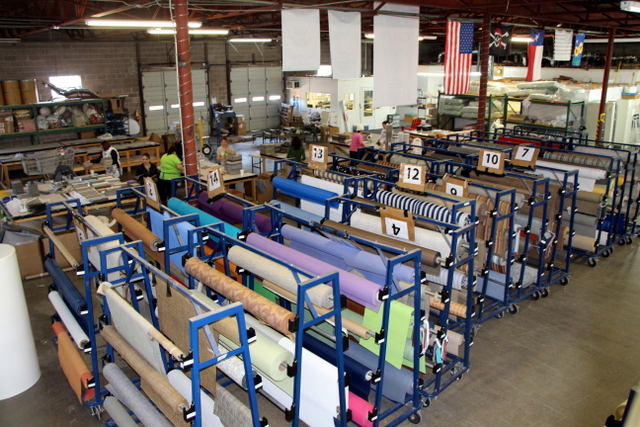 They have long since grown out of the garage and into a company servicing the patio furniture, patio slings, and marine upholstery industry across the US. As president, Debbie runs the company with an infectious entrepreneurial spirit, constantly looking for new opportunities that will utilize her experienced staff of almost 50 people, wide selection of fabrics, patterns, sewing machines, and web expertise. Debbie is a self proclaimed web-guru owning 297 domain names and counting (she’s probably getting a new one while you read this!). 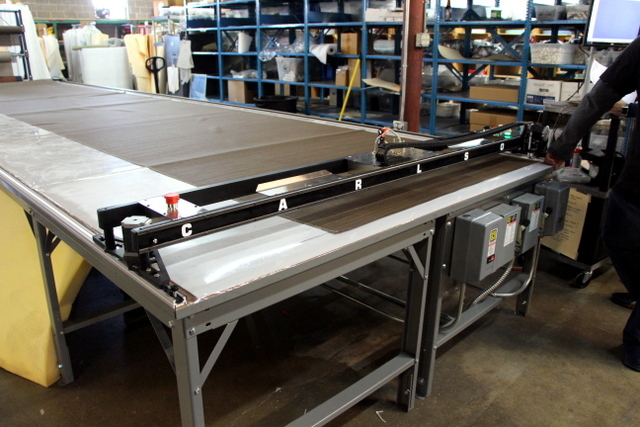 In January 2014, Chair Care added a Carlson Design Plotter/Cutter and T-Bar Pattern Digitizer to the mix. We asked why they chose Carlson and Steve said, “because your price is right on the website! What you see is what you get”. 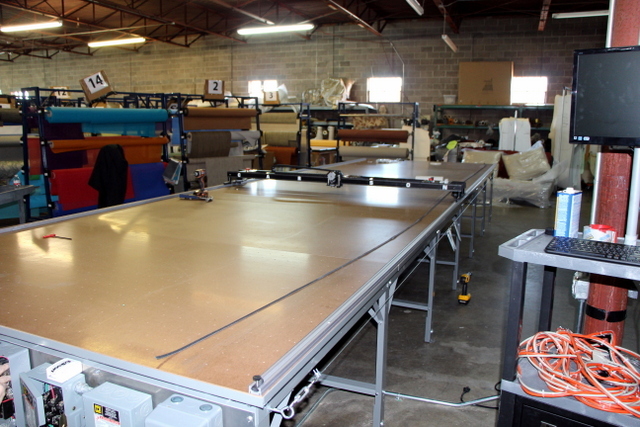 They are now automated to cut samples, slings, chairs, and marine upholstery — with the digitizer adding more patterns and parts to this list every day. Deb has a taste for automation, she’s looking to the future, and ready to cut YOUR next big project. 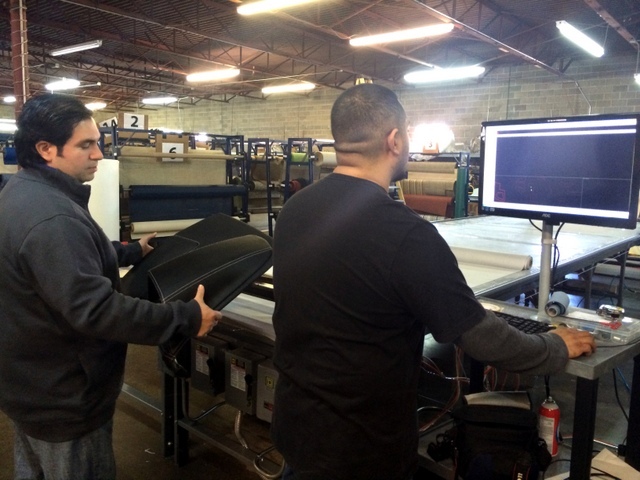 When Chair Care decided to automate their cutting, they had a few skeptics in the house. 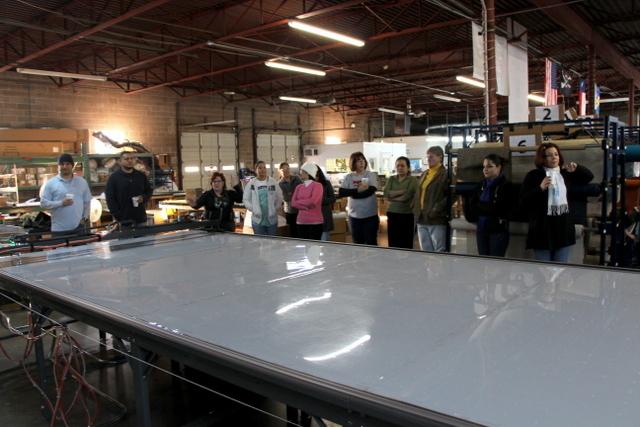 However, after our first production run, it was hard for anyone to contain their excitement. Automation Induced Joy. "My hands already feel better!" Before we go any further, let’s have a look at their system. 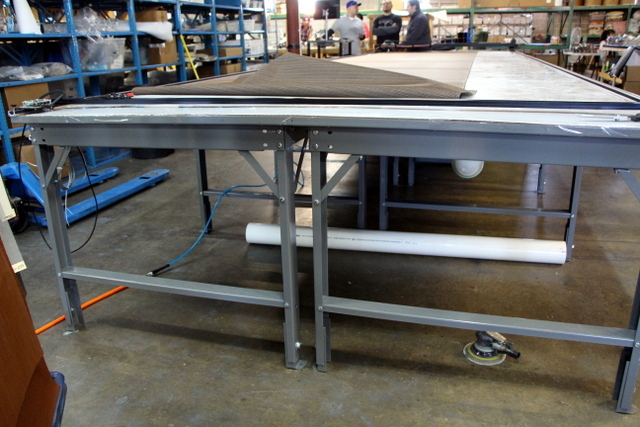 Chair Care Patio purchased the PT-84″ Plotter/Cutter on a 7’x24′ long vacuum table. 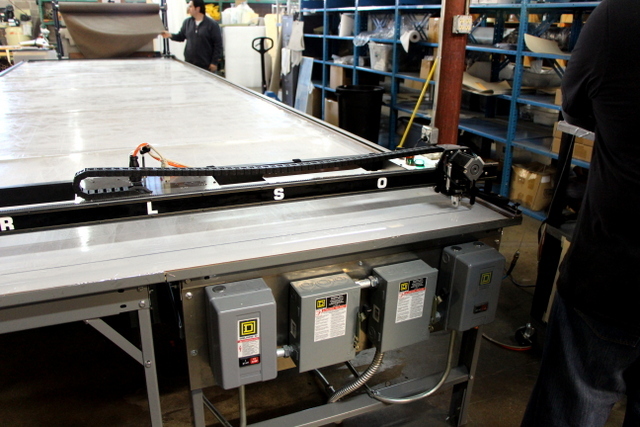 At 84″ wide, the PT-84 can plot/cut up to 74″ wide material. 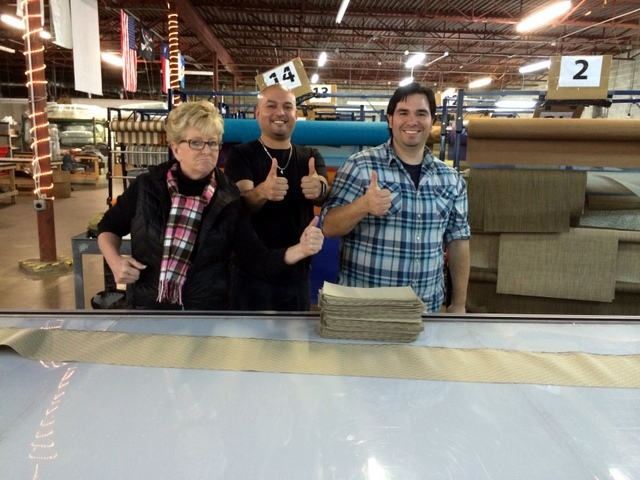 Dream team: Deb, Valdo, and Lucas give a thumbs up after the first cut! We installed their system on a quiet Sunday (step-by-step pictures below). We performed our first demo cut that night for Deb, Steve, and her two managers Valdo and Lucas. First thing Monday morning it was “show time” for the whole crew. We started with an empty table and a big audience. Empty table - what shall we cut? Pick a fabric, any fabric! What a good looking shop. Whatever you pick, just don't mess up! 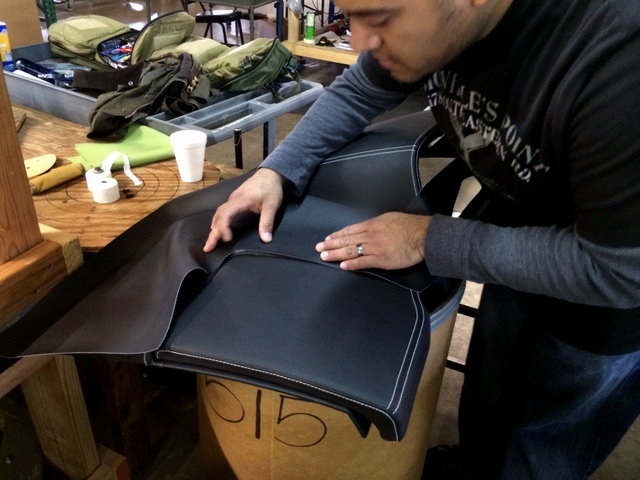 Chair Care is cutting a wide variety of materials including marine vinyl, acrylic, and porous seat fabric. 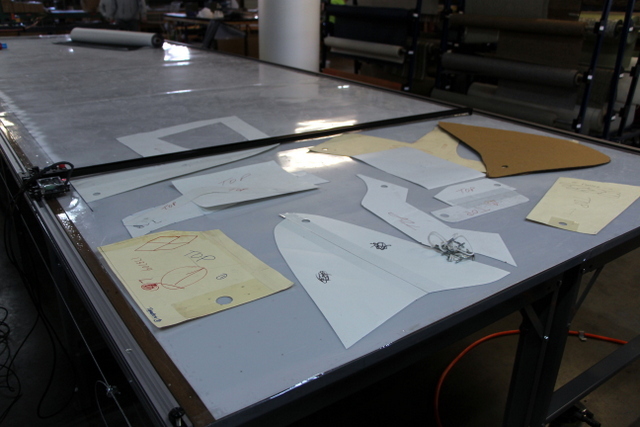 For more porous materials, it is necessary to “vacuum bag” the table to prevent material shift. 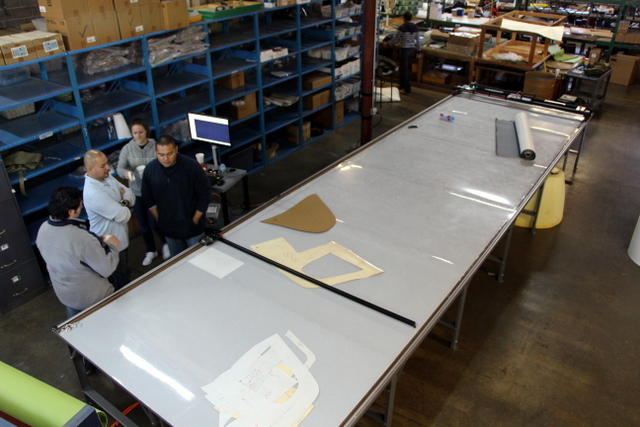 This is where we cover the table with a thin mil (.00075″ thick) plastic sheeting. 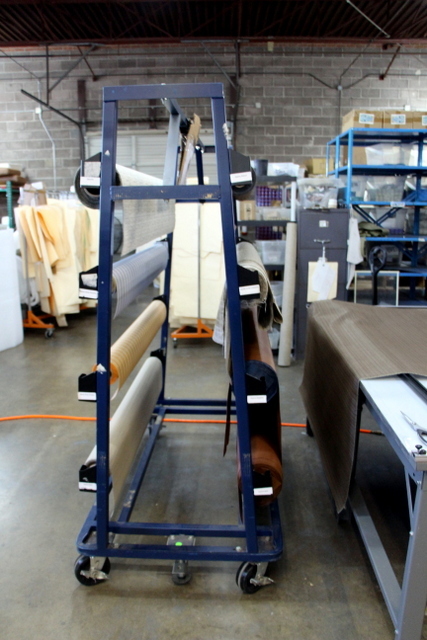 The plastic roll width is sized to their material, available in a 4000′ roll, and the cost is less than $0.06/table ft. Bagging material allows them to run their machine much faster because it virtually guarantees the material will not shift during cutting. Material is vacuum bagged to prevent shift. After teasing the crowd with their new equipment, it was time to get to work. To begin, we wanted their three managers – Lucas, Valdo, and Margarito — to have a good understanding of basic digitizing, editing, nesting, and cutting. 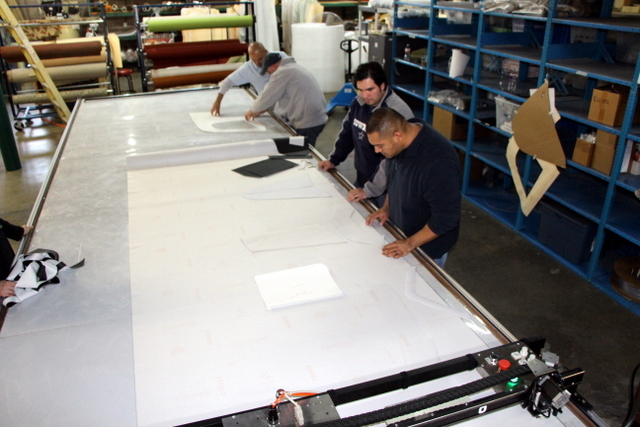 Since Chair Care planned to cut fabrics for a wide variety of applications it was important these guys had a good handle on the operation first. We are only able to train for a few days, so having your managers familiar with our equipment means they can train other operators after we leave. Chair Care operates a mutli-lingual shop, so…we train Valdo and Valdo trains everyone who speaks Spanish: https://vimeo.com/84876079. To start, Chair Care needed to get their patterns in the computer. They have A LOT of patterns. Rome was not built in a day. Neither was this pattern collection! WOW That's a lot of patterns! 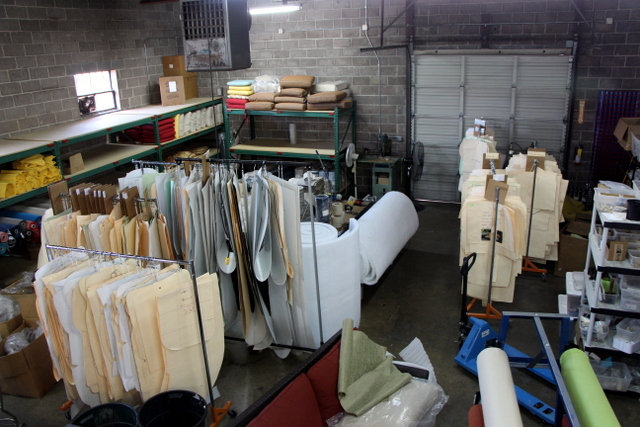 Digitizing your pattern library is a great way to build your company's value. 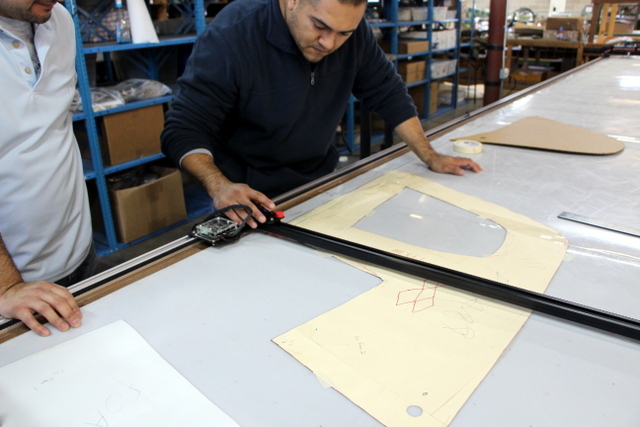 They will digitize these patterns using the Carlson Design T-Bar Pattern Digtizer. 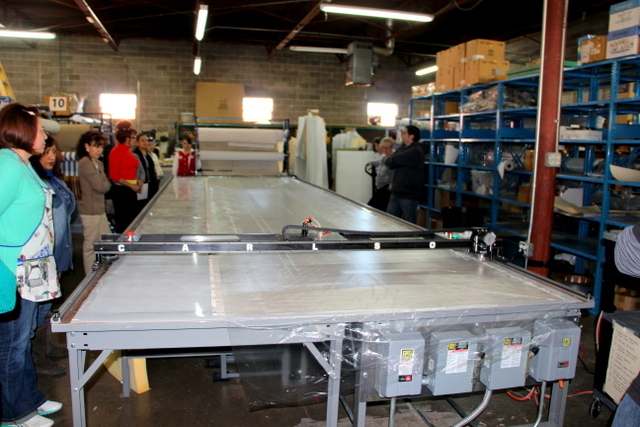 The T-Bar digitizer rides on the same track as your plotter/cutter, giving you a digitizing bed the size of your table. Request extra track to install separately. 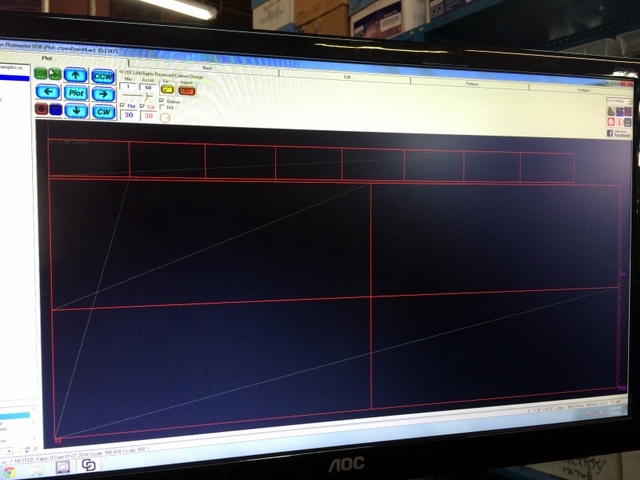 For our first digitized pattern set we selected a skew for a marine dash board they had a standing order of 25/ week. This consisted of 11 vinyl patterns and 3 foam patterns. All of the patterns for a dash board. Vinyl and Foam. Before you start patterning, it’s important to make sure each pattern has a unique name and whoever is digitizing FULLY understands all of the pattern notes including grain direction, markings, left vs right. top vs bottom, quantity, etc…The plotter/cutter will always cut exactly what you digitize. So, if you digitize the wrong thing, that’s a problem! 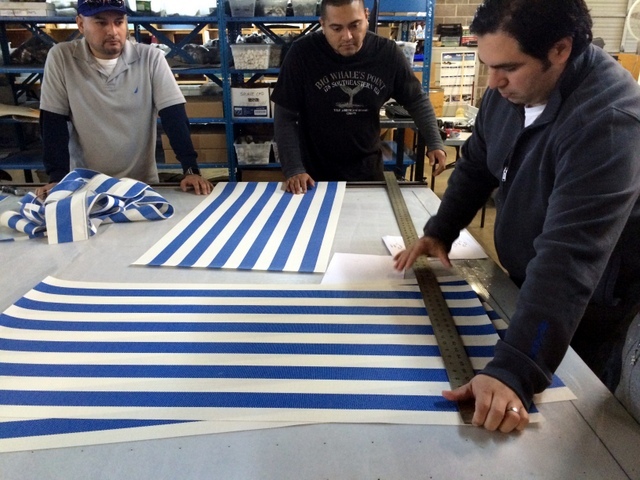 It's important the guys that work with the patterns daily explain any notes or "trade secrets" to the guys digitizing the patterns. The T-Bar connects AND is powered via USB. Connect the T-Bar to your workstation to begin digitizing. It's that easy! Secure an existing pattern (pro tip: use a large piece of plexi-glass). Manually position the targeting laser above a significant point on the pattern. Click the record button to create points and work your way around the pattern. There is a button for plot (blue) and cut (red). The pattern is only as accurate as the operator, so it is important to be consistent and systematic. Once a pattern is digitized, it should be cleaned up in Pattern Editor (PEdit). This consists of eliminating any unusual points and snapping the start-and-stop points together. Once all of the patterns for a job are digitized, nest them together before cutting. Nesting maximizes material yield. If your material has a grain, it is important not to change your pattern’s orientation during nesting. Pro Tip: Try our Autonesting. For a small $ it will save $$$ on time and material. Lucas and Margarito are checking virtual vs. real before finalizing their nest. Once nested, it’s time to cut! Average cut/load time was ~6minutes. That means they can cut a week’s order (25 units) in less than 3 hours. Previously it took one person 2-3 days of non-stop cutting! HOW ABOUT THAT!?! 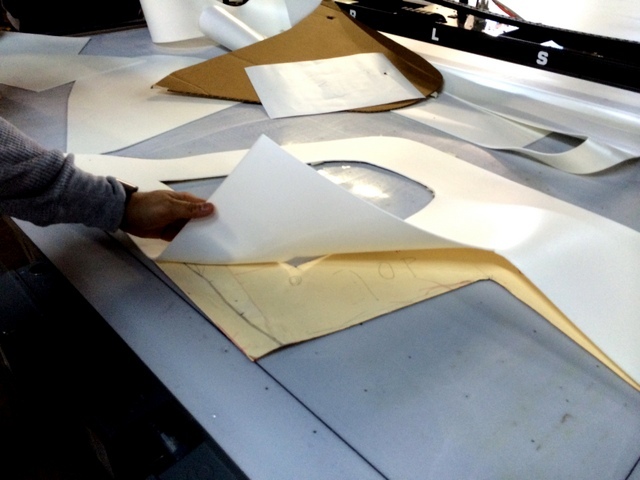 Checking cuts by overlaying on the original patterns. Checking the grain matches the "sample". Cuts looks great -- Thumbs ups! Cut time reduced from 2-3 days to 2-3 hours. They also needed to cut 1/8″ foam patterns to pair with the vinyl set. We provided a high-lift 28mm steel rotary blade for cutting thicker material. Our blade holders magnetically mount, so switching only takes seconds and does not require any tooling. Here’s a quick video of cutting the nested foam patterns: https://vimeo.com/84876681 — what a versatile machine! 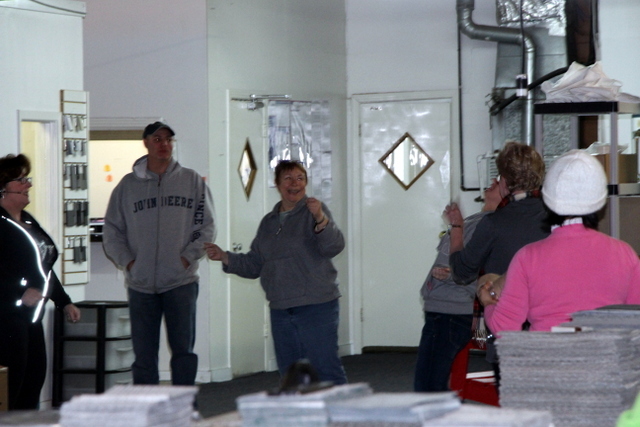 After all that digitizing it's time for a LUNCH TIME DANCE BREAK! These guys are a lot of fun! After lunch, we continued to digitize patterns. The next job was a standard patio seat set. Digitize, Edit, Nest, Cut, Check. Wash Rinse Repeat. Glamour Shot. Deb's in the back ground "supervising". Once we established the basics — Digitizing, Editing, Nesting, and Cutting — we explored cutting samples, patio slings, strips, and stripes. Preparing to cut patio slings. 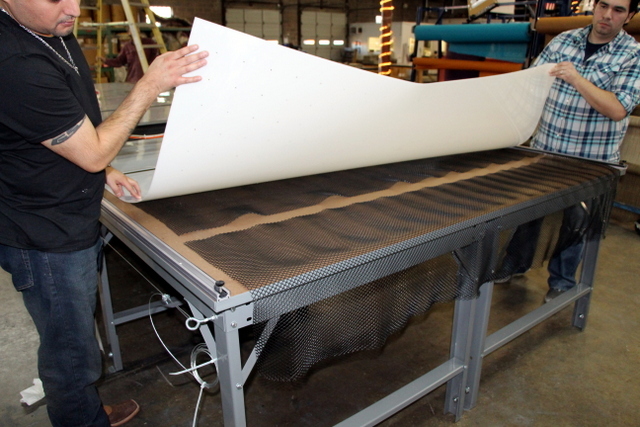 Using the rectangle maker the plotter/cutter can quickly generate 2×4 grid of 53.5″x23.25″ rectangles. These identical rectangles plot/cut in ~30seconds: https://vimeo.com/84806235! 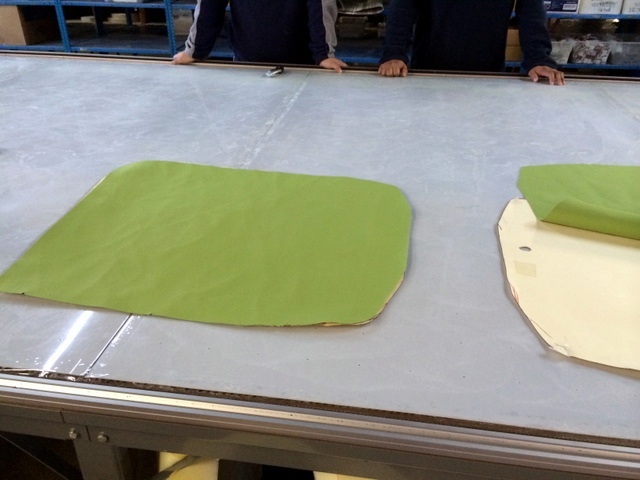 To make a good-thing-great we added 6″x12″ samples squares to the outside of the nest to improve material yield. 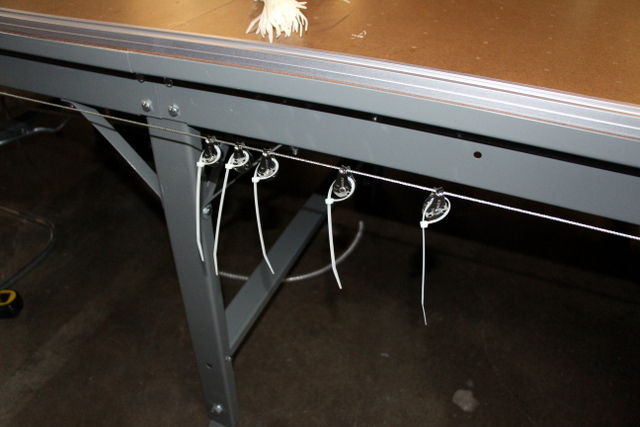 Nesting samples with production decreases waste. 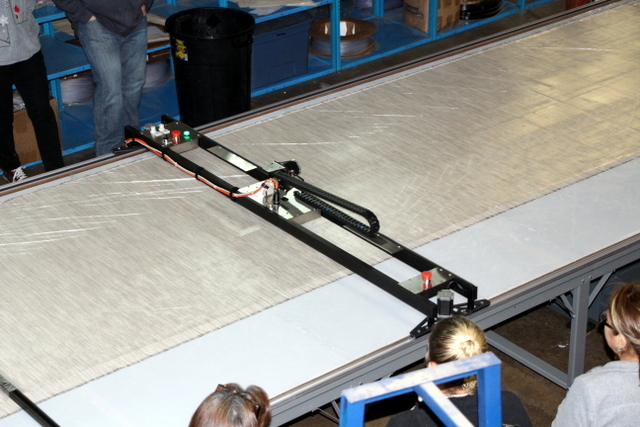 The Carlson plotter/cutter cuts a patio sling every 7.5 seconds (300-400 per hour w/ load and unload). Martha, their current “sling cutter”, estimated she could cut a patio sling every 60 seconds. An impressive gain. HOWEVER, when we looked at Martha’s numbers, she was actually cutting one every 200+ seconds (17 per hour). WE ARE 25X+ FASTER!!! 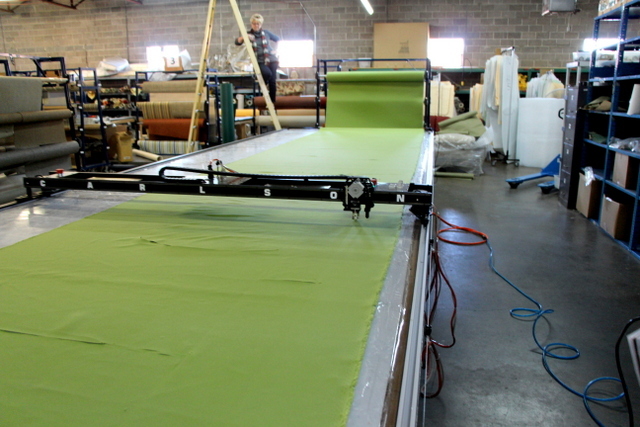 They currently cut 600, 6″x12″ rectangles for every fabric they carry and bind them in a sample book for their major customers. 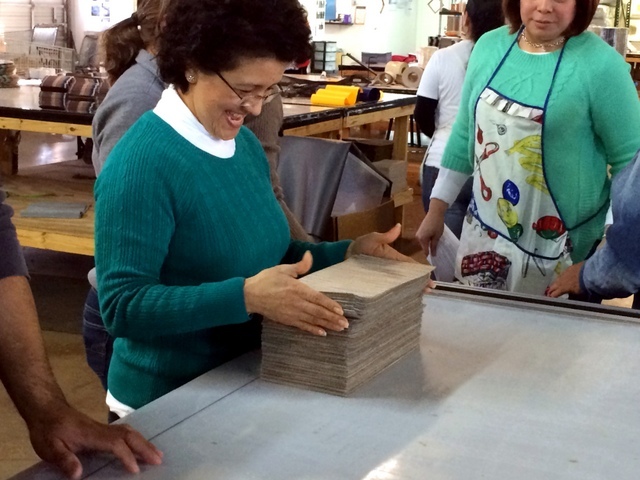 Cutting these samples takes over an hour per material by hand. We cut 180 samples in two minutes and 30 seconds. 600 in about 12minutes. Checking the taper. Matching the stripe. 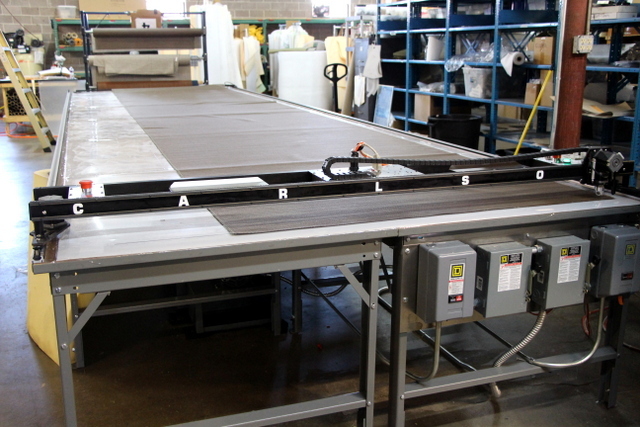 Chair Care Patio is now well positioned to take on more customers, more SKUs, and more custom cutting. They’ve added a system anyone in the shop can use to create stored, repeatable, optimized patterns that can be quickly and accurately cut again and again. We would like to give big thanks to Steve, Debbie, Lucas, Valdo, Margarito, Susy, Kate, Jim, and Martha. This is a fun company to work with and we are really looking forward to our next visit to Dallas so we can say “hello”! If you are interested in how to setup a similar system, keep scrolling down to see pictures from their install. 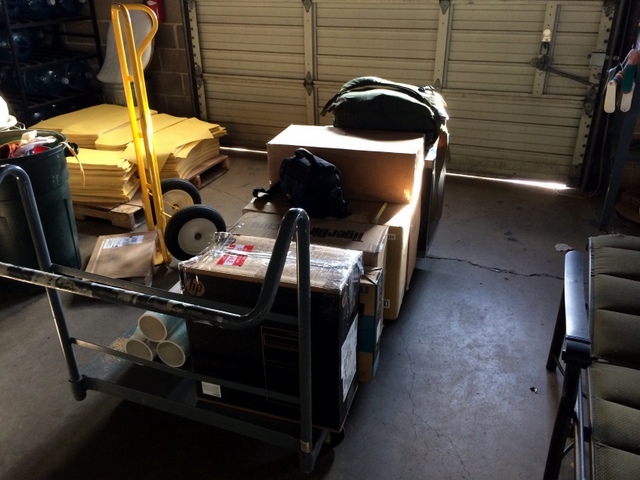 We arrived in Dallas on a Saturday and dropped off their Plotter/Cutter and components. Our components are light. We hand loaded everything from a pickup truck. 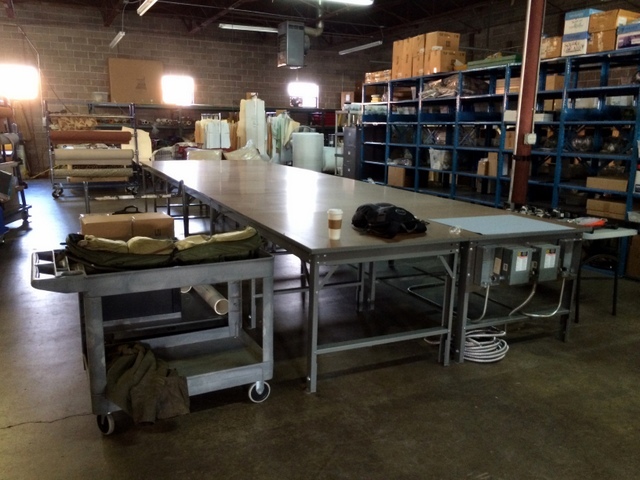 We shipped their table two weeks early so they had time to pre-assemble and level. This corner of the building has a slight slope, so leveling before hand saved a lot of time. Using a bottle jack, we made fine adjustments before installing their track. 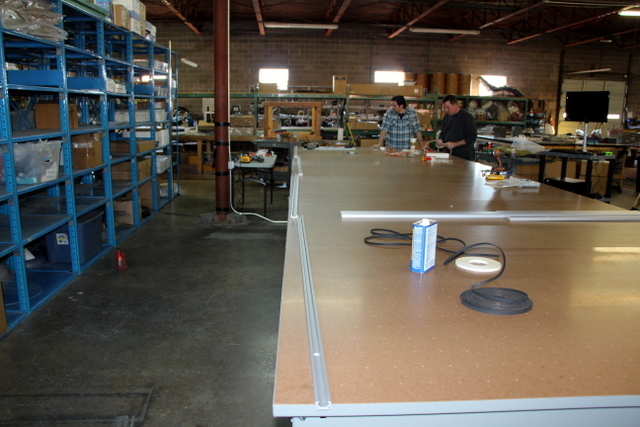 Assembling the table is NOT required before we arrive, but it does speed up installation by 3-5 hours. 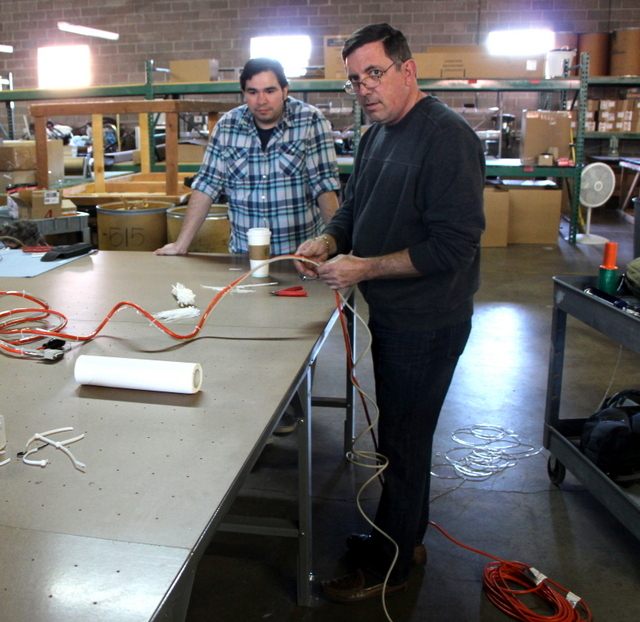 Their hard work meant we could run our first test cut later that afternoon. They Pre-assembled their table. This allowed us to cut later that afternoon! 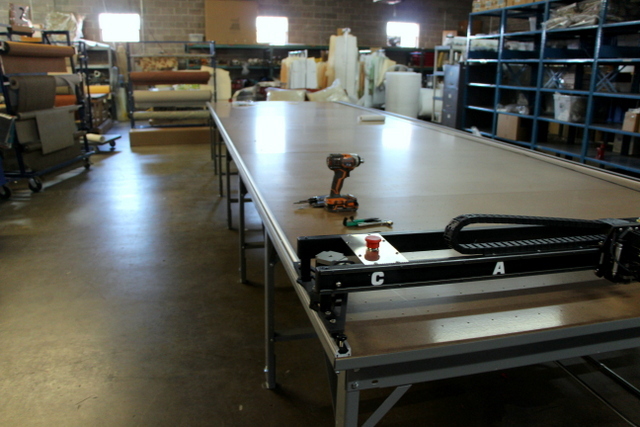 7'+ wide tables have a support down the center. This is a very sturdy table. The plotter/cutter is packed in a UPS/FedEx/DHL acceptable box. 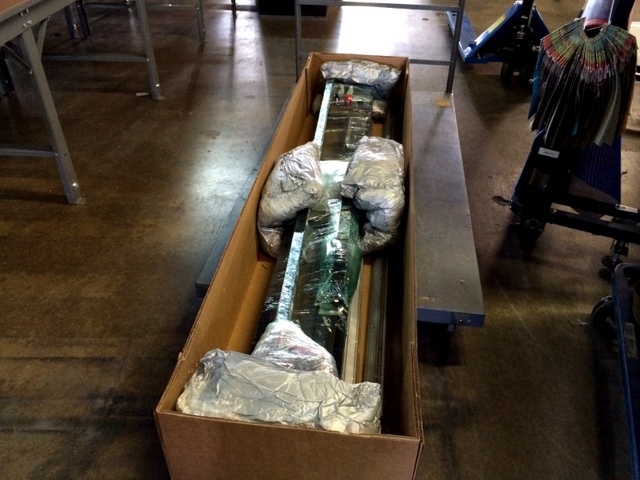 While every repair can be preformed in-house, it's easy to ship back for service. 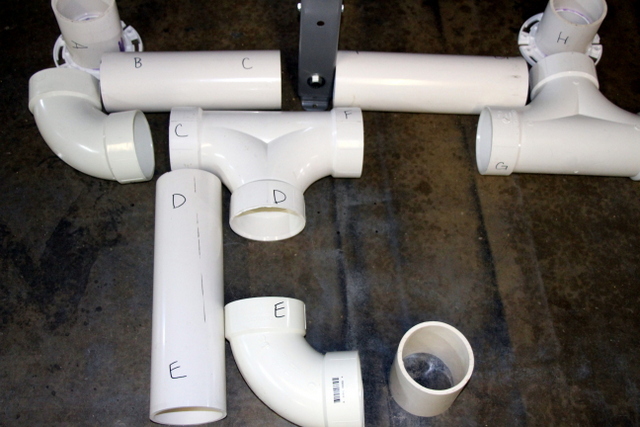 Plumbing layout clearly. The front side of the table is marked by letters and the back side with numbers. 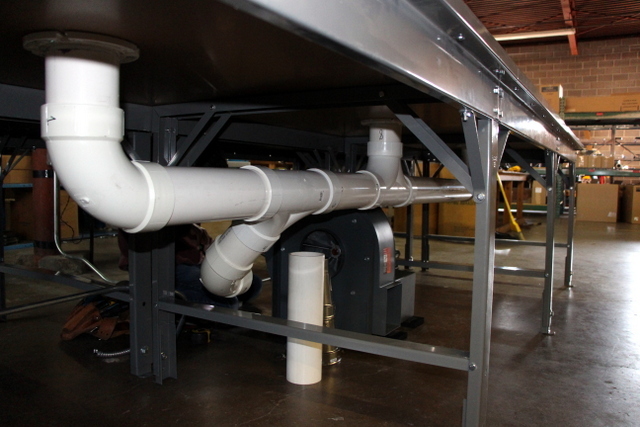 Position the blowers early, so the electrician can begin wiring asap. It is important you contact a local electrician to make sure everything is done to code. 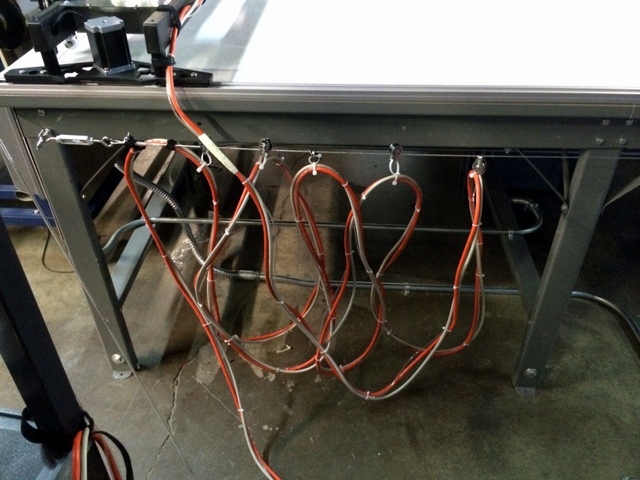 The plotter/cutter, computer, and workstation should be wired to 110VAC, 15amp dedicated circuit (rated for dual voltage for international customers). 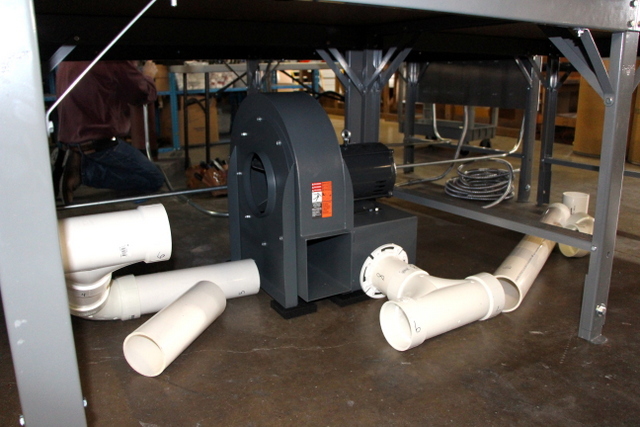 The blowers are available in single and 3Phase models, of varying horse power. 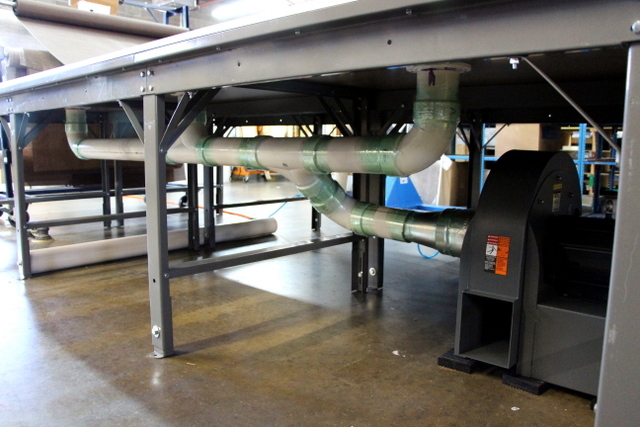 For their 7’x24′ vacuum table we provided two 5HP radial blowers. 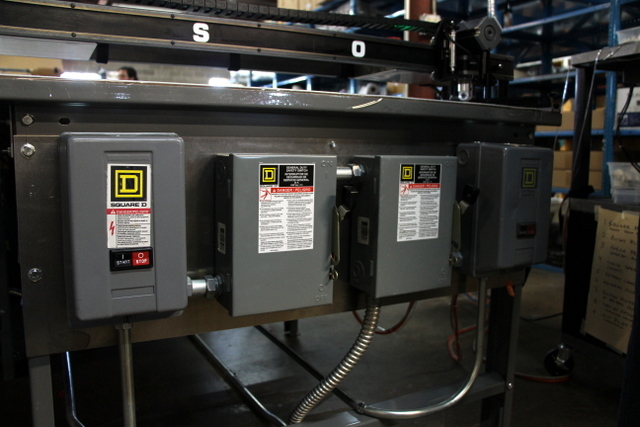 They each require 230VAC/12.5amps and a motor starter or VFD (user provided). Jim is a local electrician. He is wiring the Plotter/Cutter and PC's dedicated circuit. 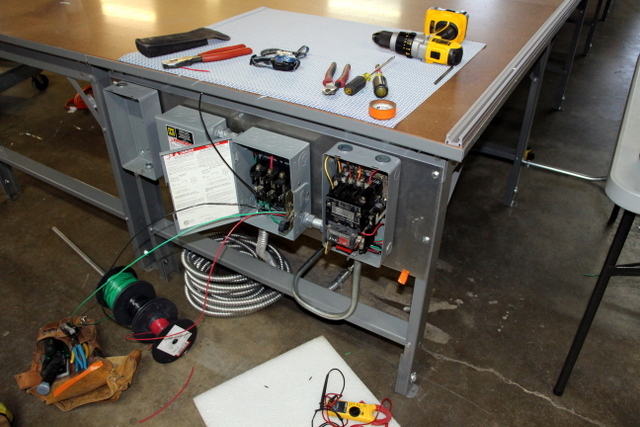 Wiring a motor starter/switch for each blower. Assemble the operator’s workstation. 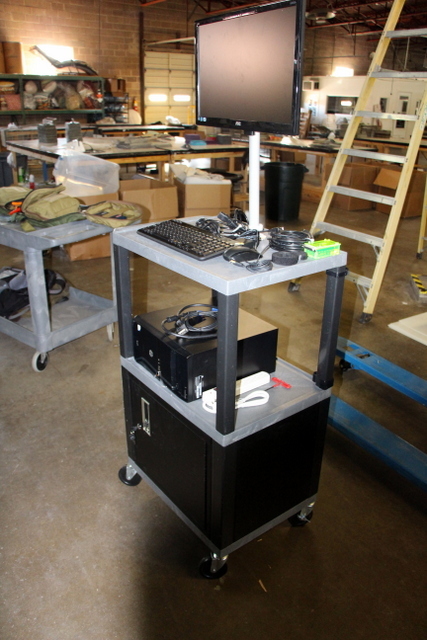 Having a workstation on wheels meant we could use the same PC for cutting AND digitizing. Attach Plumbing. 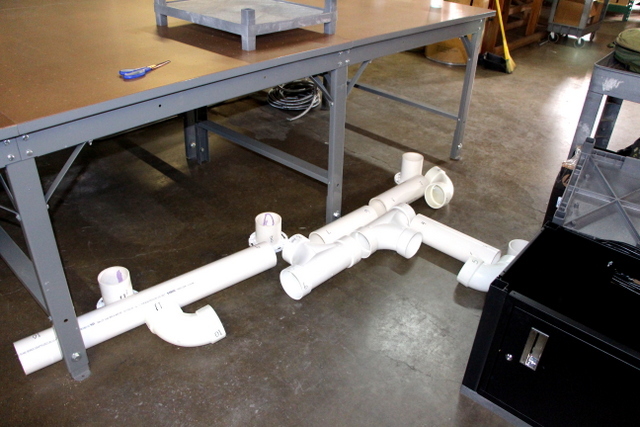 Secure flanges with caulking to prevent leaks. 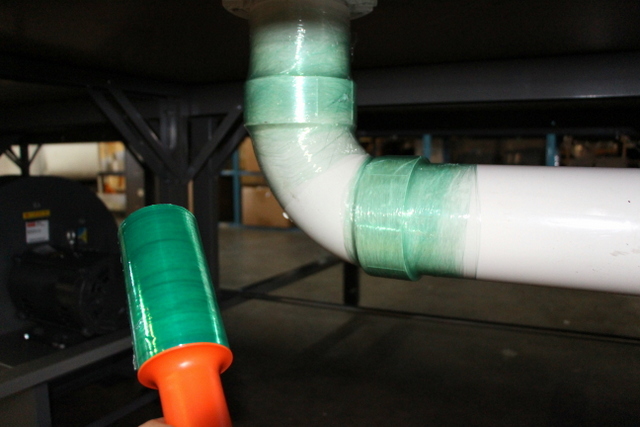 Wrapping joints with plastic stretch wrap also helps prevent leaks. 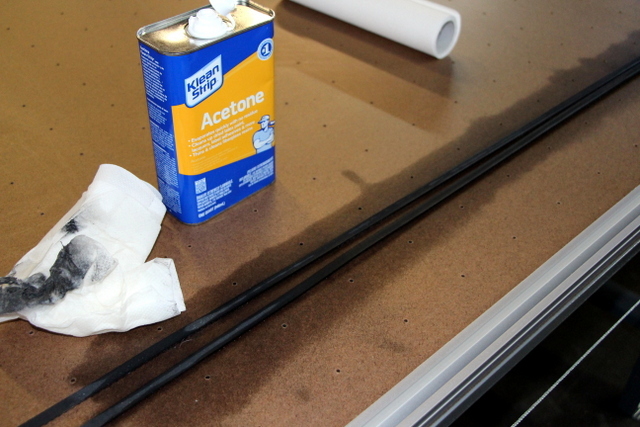 We prefer this to PVC glue because it allows you to easily reconfigure your layout later. Attach reducer with hose clamps and sheet metal screws. Put caulk on the blower collar before attaching to prevent leaks at the blower/reducer connection. 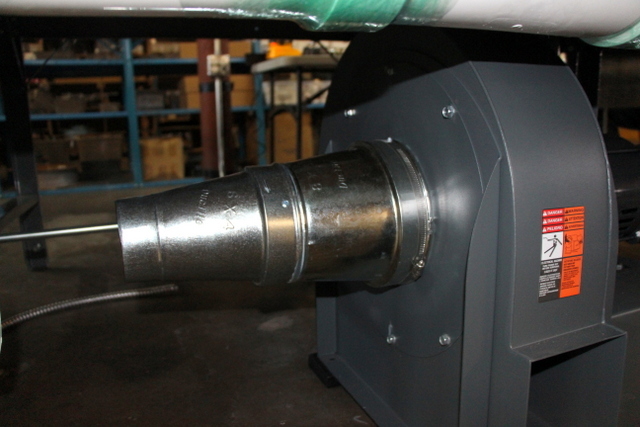 You can reduce blower noise with a table skirt or insulated box. A piece of foam placed around that section was a good temporary solution. Sort track and set track pins. Zip tie air, power, and control cables together. Thanks Steve!! Use the cutter as a Jig to attach side B. Work your way slowly down the table, making sure the track is very parallel. Side-mount cable management. Tighten with a turnbuckle. 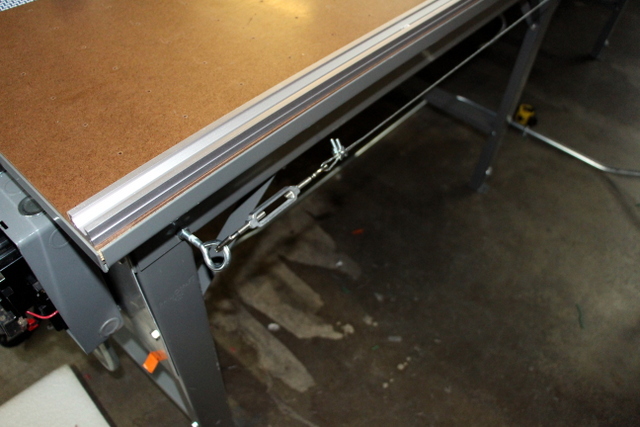 Use one pulley per 5' of table. Attach Cabling. Cable from plotter/cutter should first connect to the last pulley. Clean track belt and attach. 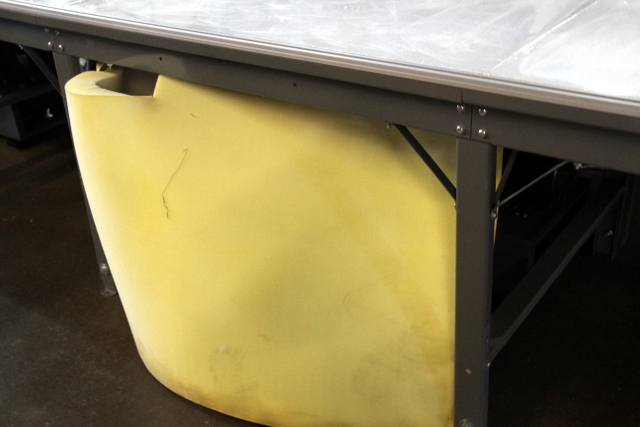 Cover table in mesh, and attach plastic cutting surface. 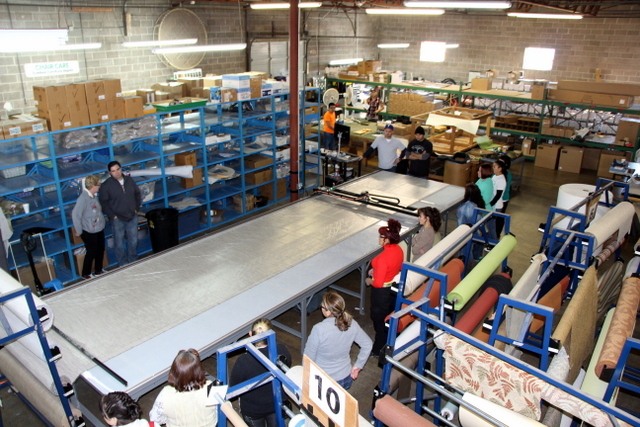 Rolling Roll Rack at the end of the table makes loading and unloading fabrics a breeze. 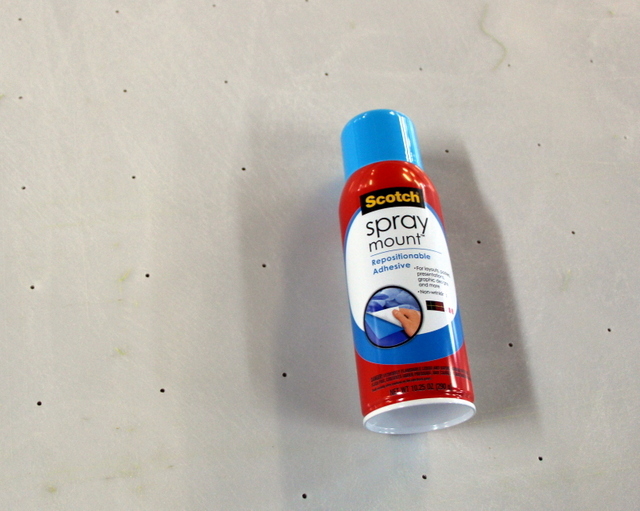 A light coat of repositionable adhesive spray will greatly reduce material shift, even when the vacuum is turned off. Big thanks to Steve and Deb for all of their help! And her great managers (including Lucas, not pictured)!